When a young person responds to the question “What is democracy?” we often hear simple answers, like “freedom” or “rights.” As vital as those concepts are, they need definition. The nature of democracy changes and grows along with its citizenry. But it is always based on principles that help citizens modify, uphold, and strengthen their democracy. Below are activities to help students understand the complexities of democracy. Note that the DDA lessons under the Lessons tab include links to principles addressed by the activities below. This “each one teach one” activity enables students to list the principles of democracy and explain the meaning of selected principles. Students teach a principle to others as they simultaneously learn from others, reflecting on which principles they value most. 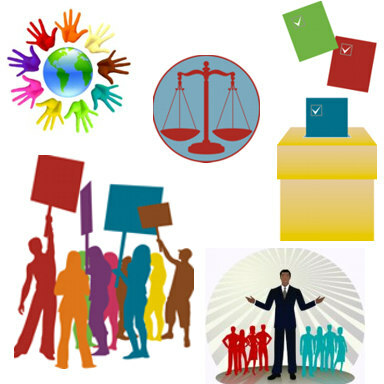 In this discussion activity, students learn about four elements of modern democracy: diversity, dissent, deliberation, and decisionmaking. Students analyze the interaction of these elements and reflect on the role of deliberation in making decisions. In this lesson, students work in small groups to analyze the principles of democracy at work in their country and “score” how well the principles are working in their country. They also learn to discuss ways to strengthen democratic principles in their country. In this activity, students work interactively to identify the qualities of an effective participant in a democracy, reach consensus on the three most important qualities, and reflect on society’s understanding of what it means to be an effective citizen. In this activity, students drill down on one principle of democracy and teach that principle to others. But first, the whole class participates in a discussion of the meaning of democracy. This activity allows students to work in groups to draw a “roadmap” to democracy in a fictitious country. In the process, they identify and describe elements of democracy and threats to democracy as well as explain the role of a citizen in supporting a democracy. This handout lists 14 principles of democracy along with definitions of each principle. The handout is referred to in each of the activities listed above and is a great discussion starter for having your students think and share ideas about what makes a healthy democracy. Print out small posters of each of the 14 principles of democracy referred to in the handout. These educational posters make a wonderful addition to the activities listed on this page and/or classroom decoration! Deliberating in a Democracy in the Americas is made possible by a grant from the U.S. Department of Education's Office of Safe and Healthy Students Award #Q304A100003.